Coney Island, New York, circa 1905. An attraction called "Fighting the Flames." 8x10 inch dry plate glass negative, Detroit Publishing Company. View full size. Submitted by JeffK on Mon, 07/18/2011 - 11:08pm. 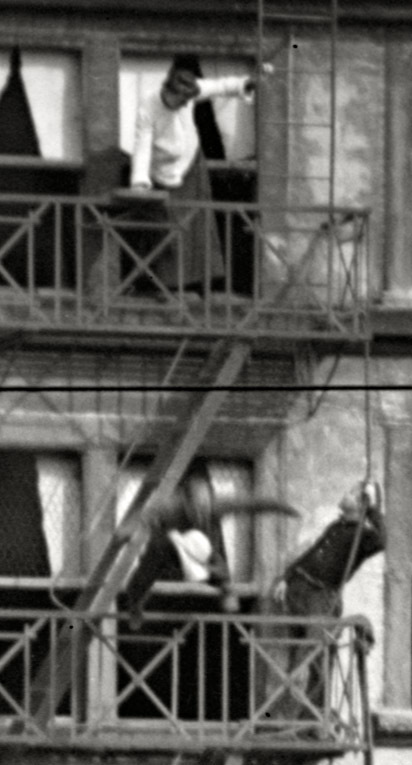 Is that guy gonna bounce off the awning and land on his feet and say "TA DA!!"? Submitted by Mike Calo on Mon, 07/18/2011 - 9:31pm. As a volunteer firefighter I couldn't help be worried about the fate of that structure - there were only two hose and ladder companies for such a large structure, only one working hose line and one chief officer (white helmet). Then I noticed the "real" people in the foreground and noticed the advertisement for FIGHTING THE FLAMES. Then I saw the repeating horizontal lines in the photograph and realized it was some sort of backdrop. As I said before, Whew! And, for myself, an added "Duh!" Moe Levy says "Fire Sale! Bargains Galore!" Submitted by Don Struke on Mon, 08/23/2010 - 10:07am. I was sure the product names on the backdrops not particularly in flame's way (so to speak) were things people actually could buy. But Moe Levy's emporium, right smack next to the action, had to be fictitious, I thought. Who wants to have a company name associated with tragedy, real or make-believe? 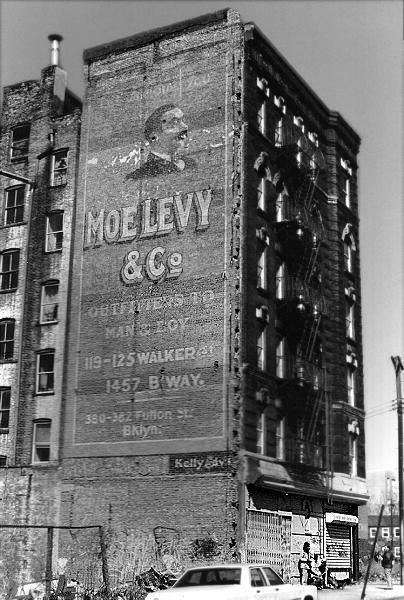 Then I found this photo on Walter Grutchfield's site with this text: "Moe Levy 'Outfitters to Man & Boy' (established 1882) was in business as Moses Levy, tailor, at 119 Walker St., New York City in 1896. Moe Levy manufactured and retailed men's clothing and specialized in low prices. "From the home base of 119-125 Walker St. (which would now be considered a part of Chinatown) he opened numerous branch outlets in the city including Brooklyn, the Bronx and Jamaica, Queens. Particularly long-lived was the branch store on East 149 St. in the Bronx, first at 409 E. 149 (1921-1939), then across the street at 380 E. 149 (1940-1951). "Moe Levy & Son went out of business in the early 1950's. This sign can be precisely dated to the range 1906-1908." Now THAT is product placement. Submitted by JohansenNewman on Tue, 06/22/2010 - 9:57am. In the one time I was taken to Freedom Land in the Bronx (now the site of Co-op City), there was a "fire" that we kids could all help all put out--the great Chicago Fire. I remember thinking as a kid "what a wonderful and new idea" it was to have an attraction like that. Ha! BTW June 19 was the 50th anniversary of the opening of that park, which was supposed to be the Disney Land of the east, but which, unfortunately, did not last long. Submitted by stanton_square on Sat, 06/19/2010 - 5:03pm. "Fighting the flames" proved to be so popular as to warrant extensive elaboration of last year's scheme and construction and recasting involving an expenditure of $40,000. 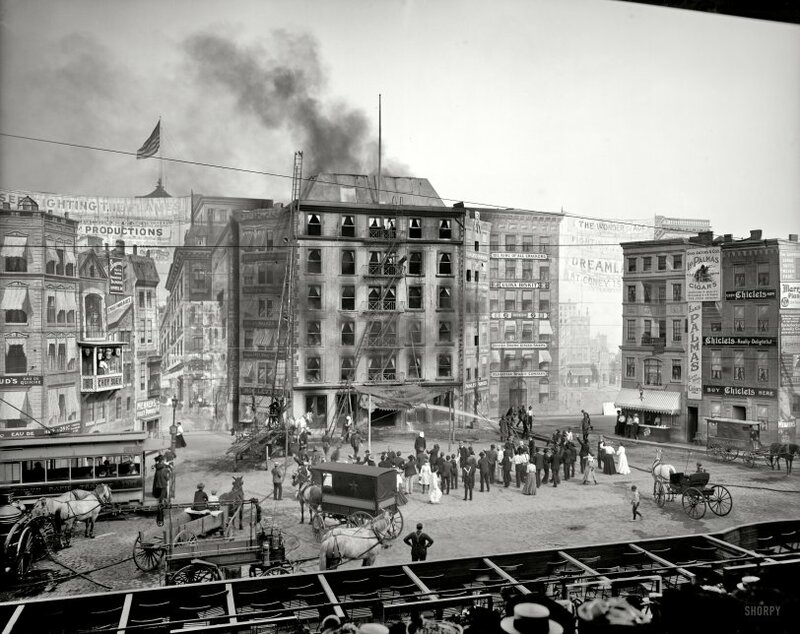 An entire block of buildings will be fire-ravaged at each performance. At the "fire lines" will be a crowd of 600 spectators. Taking part in the exciting illustration of department excellence and intrepidity will be 120 firemen. Chief Sweeney, once of the New York Fire Department, will be in charge. 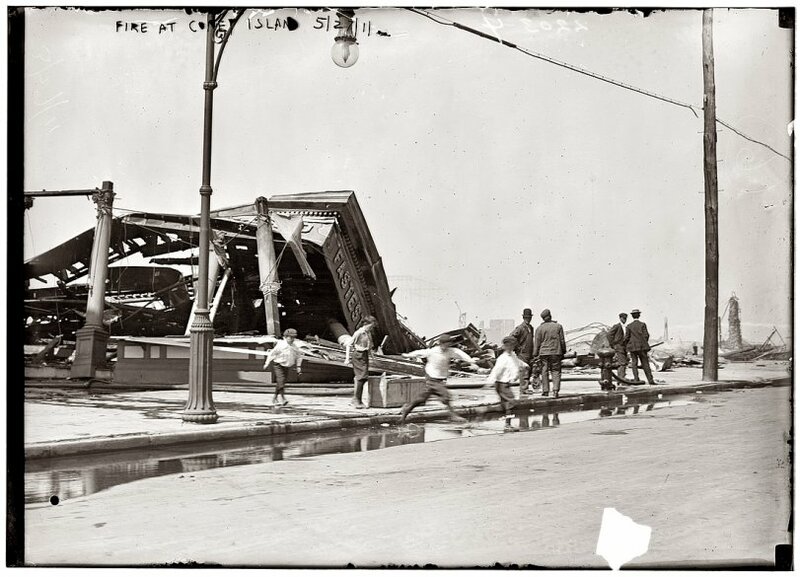 Many insurance men are nightly seen at Coney Island, with their wives and families, watching the firemen in "Fighting the Flames." Murphy, Fredrick J., 89, one-time circus man, February 15 in Utica, N.Y. He once toured with the Buffalo Bill Show, the Barnum and the Frank A. Robbins circuses. In 1904 he developed an exhibit called Fighting the Flames, which he showed at Coney Island and Revere Beach, Boston. Submitted by Anonymous Tipster on Sat, 06/19/2010 - 9:00am. Is that dude jumpin to his grizzly death? Submitted by Histry2 on Sat, 06/19/2010 - 12:39am. At first I thought the set designers were afraid of using the name Uneeda Biscuit so they came up with a pseudonym of "U-Lika Bis-Kit." But they didn't seem to have any problem touting Mennen, Painless Parker, Chiclets, and scads of other brand names. A quiet little war is being waged in the biscuit line in New York and nearby centers, the outcome of which will be watched intently by those opposed to trusts in general and especially where one will receive for their nickel an article conceded by all to be of very much better quality and manufacture. The Manhattan Biscuit Company, the largest independent bakery In the United States, are making a feature of the U-lika Bis-kit, and it has already taken a prominent position alongside of, if not in advance, of its famous competitor. Instead of spending the greater portion of their receipts telling what they mean to do, the Manhattan Company expend every possible dollar in the manufacture and perfection of the biscuit as a whole before being offered to the critical housewife and consumer. This company, must of necessity, soon occupy a distinct position in its respective line; i.e., the partial refreshing of the hungry broker in his family circle, where they all U-lika Bis-kit. Submitted by Anonymous Tipster on Fri, 06/18/2010 - 9:29pm. Wow! There is so much to see in this photo. The juxtaposition of the buildings makes it look like a backdrop for a stage. Smoke, fire engines, people climbing down fire escapes and ladders. An Undertaker wagon at the bottom. A horse drawn ambulance in the lower right. Wonder how long it would take to get to the hospital that way, and in what shape. All the advertising all over the buildings and signs. And lastly, the prophetic banner at the top proclaiming "...se... fighting the flames." And lower, "Sensational. Spectacular. Realistic." Submitted by Anonymous Tipster on Fri, 06/18/2010 - 6:27pm. Submitted by tterrace on Fri, 06/18/2010 - 3:08pm. ... Spectacular! Realistic! Now featuring that marvel of the Modern Age: Product Placement! Submitted by dsimpson on Fri, 06/18/2010 - 2:53pm. How about throwin' a few of those unredeemed diamonds my way?! Submitted by Anonymous Tipster on Fri, 06/18/2010 - 1:12pm. Dreamland burned down! No tickets required, either. Submitted by fanhead on Fri, 06/18/2010 - 1:09pm. Apparently the androgynous Mr. Brown augmented his shoe sales income with his ginger snap gig. Submitted by Vern0n on Fri, 06/18/2010 - 12:26pm. I'll take a box or two of that Mennen's toilet powder.